The Toll Road, pictured here, dates back to the late 1860’s and has played an integral role in the local history and growth of Calistoga, as well as contributing to the lore of The Old West nationally. 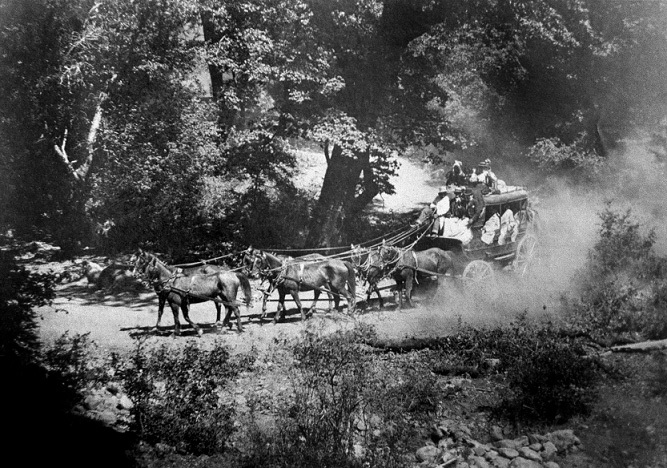 Originally built by local businessman John Lawley in 1867, the road became the main commercial artery to transport valuable cinnabar ore, necessary for gold processing, from the mines in Lake County to the train railhead in Calistoga. Later, Robert Louis Stephenson memorialized the road and its surroundings in his book Silverado Squatters. An excellent chronology of the road can be found on the web site of a wonderful bed & breakfast directly across the street from us, The Toll Road Inn and Tina & Deepak Sampath, proprietors. It appears that the original blocks of vineyards were carved out of the hillsides of Mt. St. Helena sometime in the mid-1980’s. Those first owners planted the blocks with chardonnay and christened the property ‘Jericho Creek Vineyards’. To the best of local knowledge, grapes were never harvested and wine was never produced. The land went into disrepair for over a decade. We purchased the property in 1999 and we did not have any intention of becoming grape farmers, let alone vintners. After mountain boredom set in, expert advice was enlisted from local vineyard managers and winemakers and we began, cautiously, the replant process in 2004. As of today, the vineyards are only now coming into their own and producing some of the finest grapes and wine in the region. Who knew?….